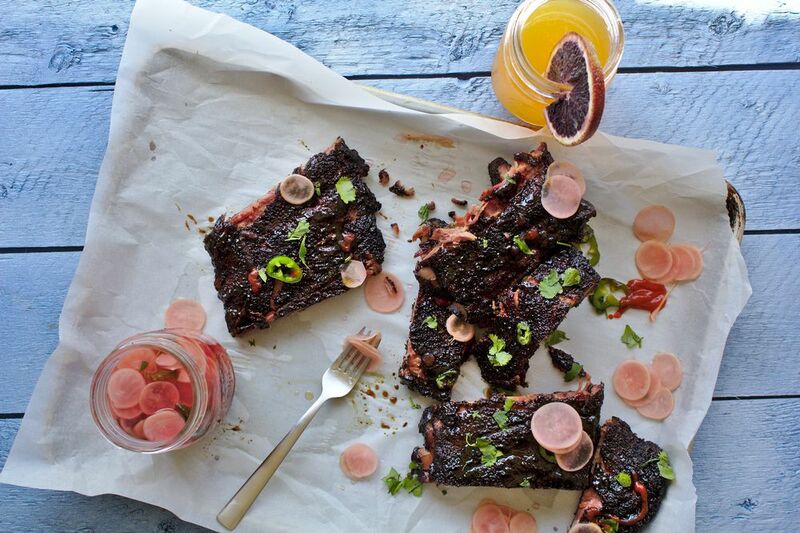 Sticky Chinese Short Ribs require little more than smoke and Chinese bbq sauce. That magical ingredient? Hoisin sauce. You'll love the simplicity of this recipe which features pink radish pickles, cucumber, and cilantro. Chinese sticky ribs are fu-un. 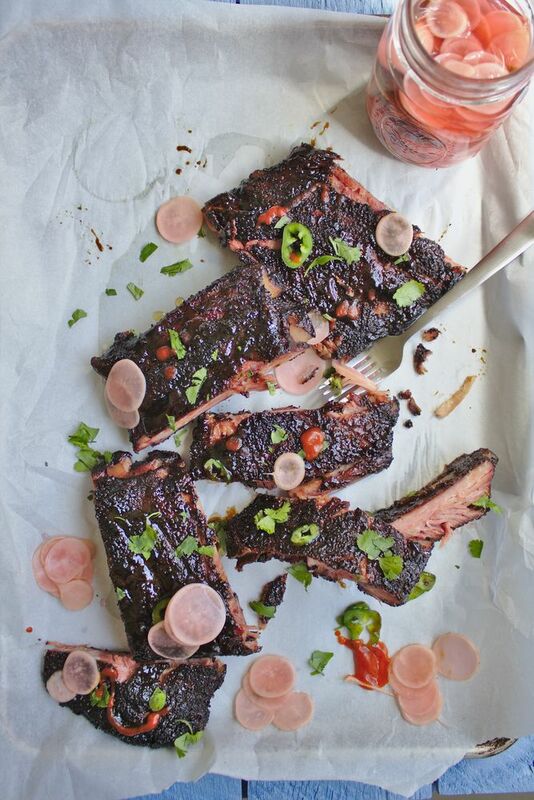 Like all good things, these ribs are smoky and messy. You’ll need napkins and a cold drink for sure. Are you ready to up your rib game? 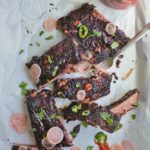 Because these Chinese BBQ Spare Ribs are so next level, yet incredibly simple to make. These ribs are actually a play on the Vietnamese banh mi — where they get slathered with hoisin sauce instead of barbecue sauce. Then, I add fun condiments like these pink radish pickles, cucumber, and cilantro. Yummy! Barbecue is a recent hobby of mine. I’ve been using an offset smoker for the past two years, but sometimes I barbecue over an open fire when camping. What I learned in short order (and you will too) is that spare ribs are delicate. There’s a short window of doneness, but once you figure out when to wrap and when they’re done, you’ve basically mastered ribs. Always use a water pan when cooking in an offset smoker. I use a tin foil pan and position it near the fire. The steam helps prevent the outside of the ribs from getting overly dry. Start your fire and wait for the good smoke. Bad smoke is dark and has an ashy quality (think bitter, acrid flavored meat). You know you have good smoke, when the color of the smoke is light (similar to exhaust fumes) and the wood is burning well. Never try to barbecue with wet wood. Maintain as consistent a temperature as possible from beginning to end. Many people put their ribs on when the temperature is too hot. 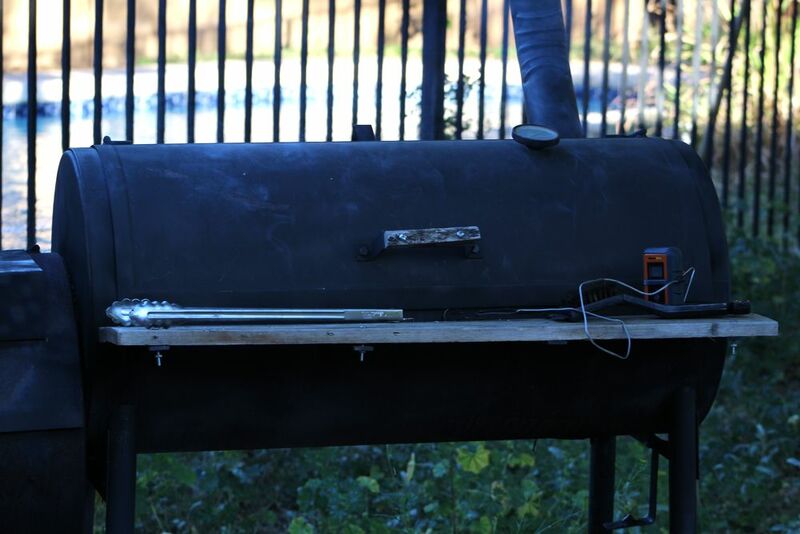 If your smoker has a thermometer, aim for 275°F and you’ll be golden. As a rule of thumb, ribs take at least 5 hours to smoke. Don’t pull the ribs just because your meat thermometer says they’ve reached 165°F. Most people under-cook ribs. They can be forgiven for doing so because to cook ribs properly, you actually have to over-cook them to go from tough to tender. You know, the one where you can see straight to the bone after each bite. While I like to use a thermometer when I barbecue, use the fold test to tell you when spare ribs are done — when you fold the ribs from end to end, you see the meat easily tear. As soon as this happens, your ribs are cooked perfectly. Wrap your ribs at the stall. The stall freaks people out (myself included) because the temperature seems to just stop rising in the meat. And it stays. And stays. But do not pull them. This is the point when I wrap my ribs in foil. You can just use the 3-2-1 method if you don’t own a meat thermometer. This is where you smoke the short ribs for 3 hours, flip and smoke another 2 hours, and wrap in foil for the last 1 hour. 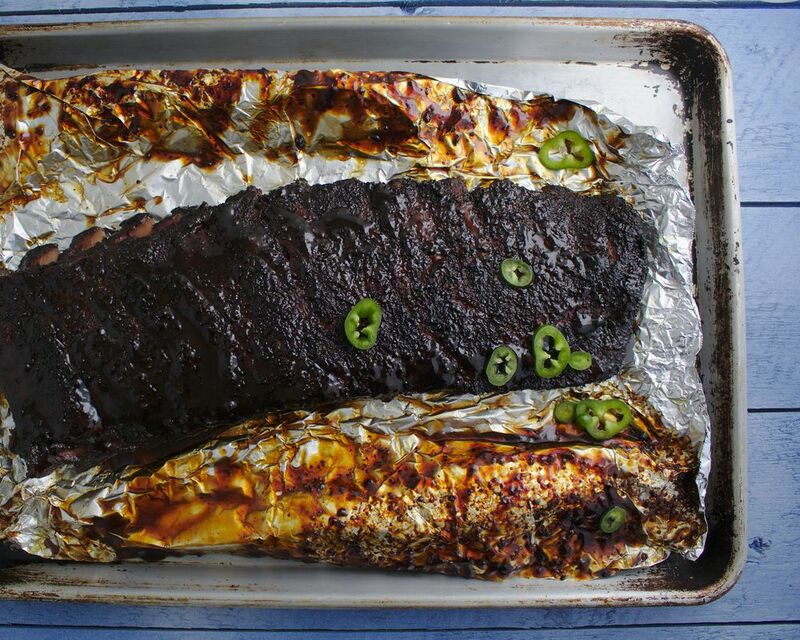 People often finish ribs in the oven once wrapped, and this is perfectly fine because no smoke gets to them anyway. Hickory – more powerful than oak. May be best for heavier meats, like beef. Pecan – faster burning. Gives a gentle, sweet flavor. Fruitwoods (Apple, Cherry, Peach) – gentle, rounded sweetness. Burn quickly. Sometimes I add a handful of apple wood just to the beginning of the fire. In barbecue, simplicity is king. Any time I smoke ribs, I use a very basic dry rub of two parts black pepper (not freshly ground) to one part Kosher salt. One rack of spare ribs requires just under 1/4 cup of rub. 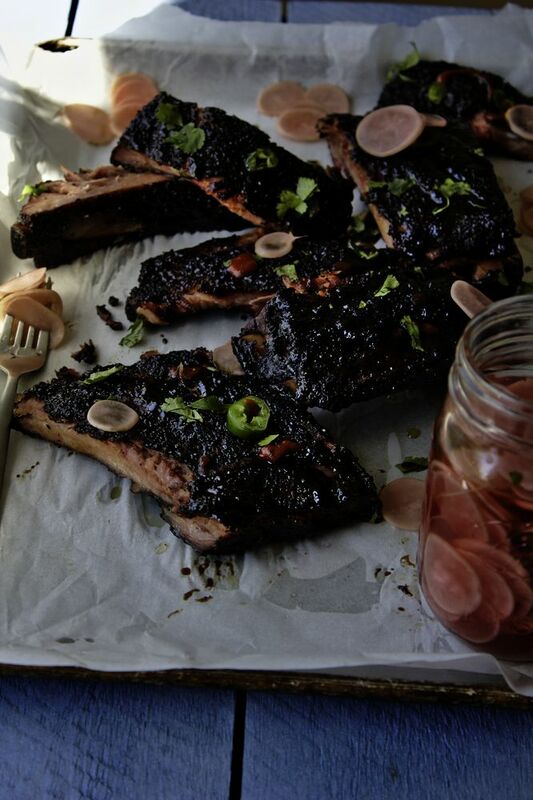 Pork Rib Rub: Mix 2 tablespoons black pepper with 1 tablespoon Kosher salt. Sprinkle evenly over both sides of the pork. 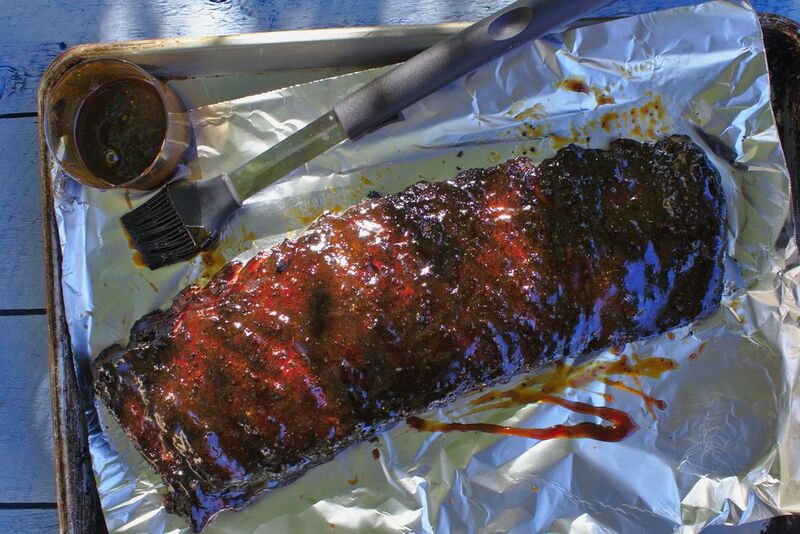 Like American bbq sauce, hoisin sauce can be brushed on the ribs and wrapped during the last hour of cooking. You get the same sticky deliciousness, slightly sweet, that compliments the spiciness of the black pepper. Hoisin sauce brushed on both sides of short ribs. Hoisin sauce is a thick, pungeant sauce used in Chinese and Vietnamese cuisine. It gets some tartness and sweetness from plums. It’s generally gluten free and can be found in the Asian condiment section of the grocery store. I’ve tried Kikkoman and Lee Kum Kee brands and both are excellent on ribs. So there you have it. The secret to perfect Chinese sticky ribs is the same wisdom that applies to all barbecue. Use good wood. Watch your smoke. Know when to wrap your ribs and pull them when they are tender. I hope you enjoy these ribs as much as we do. Sometimes it’s fun to switch things up a bit. Right? Prepare the fire and remove the ribs from the fridge. Locate the thin membranous skin. Grab and tear (you may need to use paper towel to get a good grip). Combine black pepper and salt in a small bowl. Sprinkle at a great height over the ribs to evenly apply the dry rub on both sides. When the barbecue pit is 275°F, put the ribs on a clean grate (meat side down). Smoke for about 3 hours, then flip. Continue to smoke at 275°F for another 2 hours or until the stall. Remove the ribs and brush both sides generously with hoisin sauce. Wrap tightly with foil and continue to cook for 275°F for 1 hour or until the meat tears during the fold test. Let the ribs rest for about 10 minutes before slicing. Serve with fresh cilantro, cucumber slices, and radish pickles. The Stall: refers to a period when the internal temperature of the meat stops going up or goes down. Fold Test: the best indicator that ribs are done. Hold the ribs end to end and gently fold. If the meat begins to easily tear, they are done. Don't have fermented radish pickles? Toss radish slices with a pinch of salt and a teaspoon of vinegar for a quick pickle. What ribs work for this recipe? While I use spare ribs, you can absolutely use country style or baby back ribs. Absolutely! They will be just as succulent, but they will not taste smoky. Follow the recipe for temperature and time. 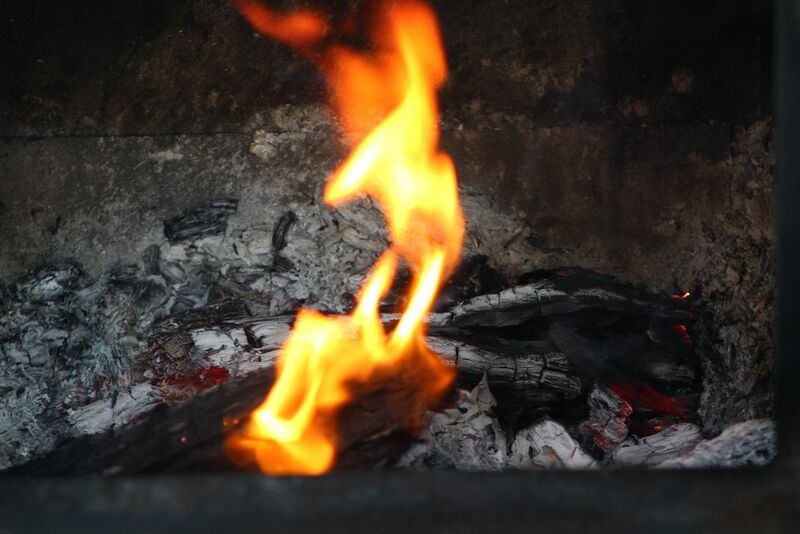 Barbecue means to cook over a wood fire (briquettes or wood).